In the new episode of Recovery ReLOVution, the show’s host, Dr. Gala Gorman, guides listeners through ways to recognize and deal with stressors. Stress management is important, especially for recovery stakeholders. Dealing with stress before dealing with the underlying cause will benefit mental and emotional well-being. In a recent article from USAToday.com, Dr. Francoise Adan, who heads integrative medicine at University Hospitals in Cleveland, discusses strategies for reducing stress every day. Gorman create a guide book to help people develop a practice of regularly finding things to appreciate. It’s called the Aware Appreciation Quick Start Guide. It can be found at AwarenessAddicts.com/AA. In this episode of Recovery ReLOVution, the show’s host helps listeners learn to deal with stress. Stress affects the mind and body. When the underlying cause is not going away anytime soon, finding effective strategies that work is critical to well-being. Living with an addict is stressful. The lingering effects of stress are not to be taken lightly. If you’re lying awake at night, or neglecting things that need attention in your own life, you are feeling the effects of stress. 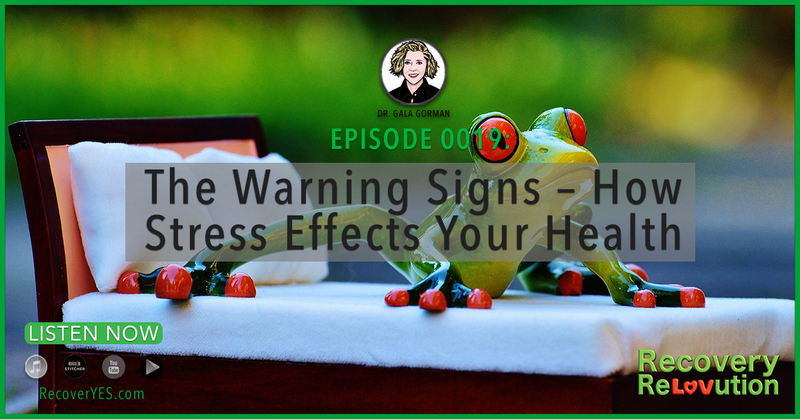 Recognizing the warning signs that stress has taken control is essential in order to build the stress management skills you need as a Recovery ReLOVutionary.